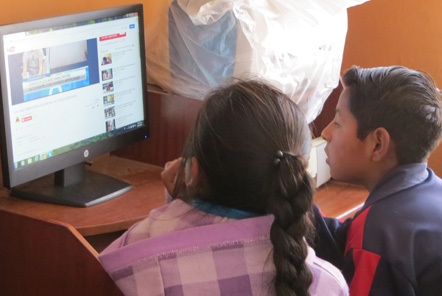 I have come to Peru to visit our children's projects in Huaraz and Arequipa - my first stop was to the Ancash Region, where I visited our Community Education project in the heart of the Cordillera Blanca mountain range. 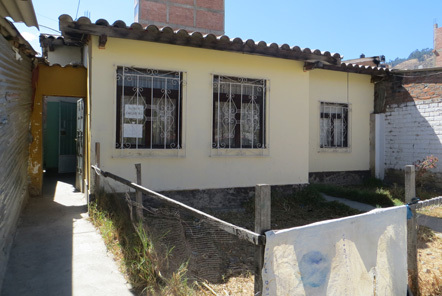 The project was established in 2006 to support a low income area in Huaraz where many children were struggling to achieve in the school system. They encourage a holistic approach to education combining homework tuition, emotional well- being classes, recreational activities and daily nutritious meals in a family orientated environment. At the time of writing there are approximately 35 children that attend the school as a voluntary addition to their education at local school. After breakfast with the other volunteers, we walked together down to the school. At the time of my visit there were two other volunteers (one British, one American) as well as the Australian volunteer coordinator who had lived out in Huaraz for almost a year. The walk is only 10 minutes, straight down the centre of Huaraz with glimpses of the mountains all around you. The secondary students arrive around 9am, on arrival they immediately sit down to do their homework. Some of the children request help from the teachers and volunteers and others are able to complete their work independently. I was very impressed by the work ethic of the students. At around 11am the school prepares a healthy snack, yogurt or oat based drinks and sandwiches, before the children brush their teeth and head off for secondary school. From 12pm-3pm volunteers have a break, some choose to eat out over the break or head back to the apartment for food, this is a good time for lesson planning but siestas are also popular! During my lunch breaks I usually tried to visit one of the local restaurants for their "menu del dia" - a set three course menu often for only £2 - £4 ! At 3pm the Primary School children arrive, they attend various schools across the city in the morning and this rag tag bunch are a little cheekier than the older students. I was just as blown away with how eager they were to get working, most students produce their homework as soon as they arrive. The younger children need more support and attention in the afternoon and maths, reading and writing are the most common homework types – my 12 times tables were challenged more than once! 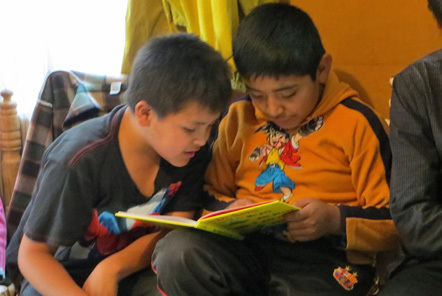 When they finish their homework they are given activities from the volunteers, this can be worksheets, educational games or even just an extension of their school work! At around 4:30/5pm recréo begins and depending on the schedule this involves a trip to the park, games or a film. Finally they too receive their nutritional snack and brush their teeth before heading home. The children attending the school come from a variety of backgrounds but all are from families of very low income. Most children are cared for by one parent or another family member and issues such as alcoholism, neglect, malnutrition, teenage pregnancy and in some cases family violence can be common. The children often come from families where the importance of education is not recognised and where they may receive little support and attention in the family home. The Community Education project works in collaboration with their families, having regular parent meetings and encouraging sibling groups to attend. They provide the educational support, food, tooth brushes, day trips and occasional clothing donations free of charge to the families. 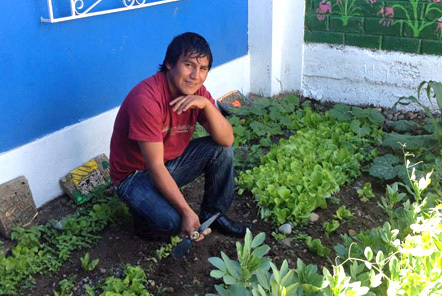 The community school also has a number of ‘graduates’ who return to mentor younger children or help around the school; one is studying Engineering in Huaraz and the other is a trainee chef in the city and frequently comes back to cook for the children as part of the nutrition project. These students act as fantastic role models for the current students. Many of the children at the school are very small for their age, when asking ‘Cuántos años?’ I frequently presumed I had misheard the answer as they looked so much younger. Following a fundraising drive from past and present volunteers they have now raised enough money to provide a nutritious snack to every child for the next year. The Community Education project is focusing on protein rich food that they would not have access to at home. A former volunteer from a social work background has implemented a mentorship program whereby the children are asked to focus on their strengths and set their own aims, whether it is academic or social. She found many of the children were focused on where they were failing at school and had low confidence, rather than identifying also their strengths. The program involves regular contact with Spanish speaking volunteers and staff to ensure that they maintain a positive outlook and achieve each aim step by step. Maths is an area that many of the children struggle in and a few students have been kept back a grade (some more than once) due to low marks. With the class sizes in Huaraz so large and confidence low, there is little room for the children to improve at school alone. A current volunteer who is also a teacher has established Maths Progress Reports for each child to identify what skills they should be achieving based on their grade and recording when they reach each level. The continuation of these projects however relies on future volunteers. 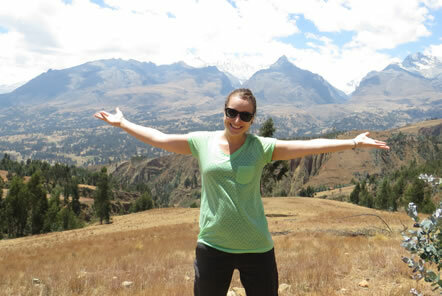 During my stay the team here were very eager to ensure I experience all Huaraz, and Peru, has to offer. 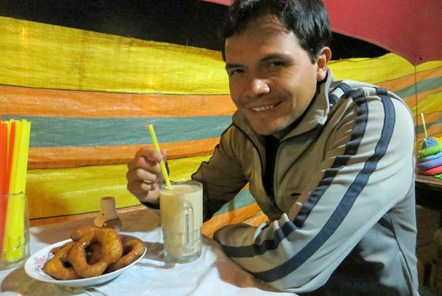 On the Peruvian “to-do” list, I ticked off cerviche (fish in lime juice), lomo saltado (Peruvian beef stir fry), pisco sours (the notorious cocktail), poncho and picarones (hot sweet milk drink and donuts - seen below) and Inca Cola (a neon soft drink). Every morning I have been amazed by the beautiful mountains on the horizon and on my final day I was very pleased to be able to get out and see the views properly - thanks to Fiona and Lacy my guides! 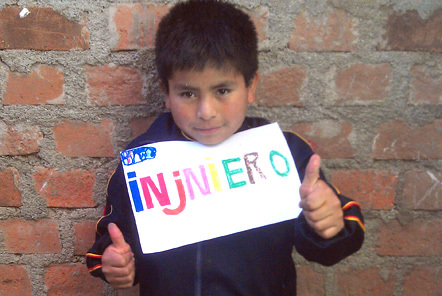 If working with children in Peru is something that interests you, click here to read more about the Community Education project in Peru.